Many scientists cheered last year when a federal judge ruled that human genes couldn't be patented. The case involved Myriad Genetics, which holds the patent rights on two genes, BRCA1 and BRCA2, that are associated with increased risks for breast and ovarian cancer. Thanks to these patents, you can't look these genes in your own body without paying a fee to Myriad. Sounds ridiculous, right? Well, that was the state of gene patents until last May, when judge Robert Sweet ruled that the Myriad's patents were invalid. But now the courts have reversed themselves again. In a 105-page decision, two federal judges decided that the whole matter comes down to the meaning of the word "isolated." I kid you not. Judge Sweet's ruling last year was based on the obvious scientific fact that genes are a product of nature, not an invention, and therefore they could not be patented. Patent lawyers were very upset over Sweet's ruling. Why was this controversial? Well, because the U.S. Patent and Trade Office has been granting gene patents for decades. Basically, once the USPTO decided to allow one gene patent, they never looked back, and they've now given out patents for over 4,000 human genes. But this past week, an appeals court reversed last year's ruling and said yes, Myriad Genetics does indeed own the rights to the BRCA genes. The decision by Judge Alan Lourie reveals an astounding lack of understanding of DNA, genes, and genomes. I guess I shouldn't be surprised, but I had been hopeful that after the earlier ruling throwing out these patents, science and logic would prevail. I guess I should never underestimate the scientific ignorance of judges, though I should add that one of the three judges voted against his colleagues. "According to Myriad, isolated DNA does not exist in nature, and isolated DNAs, unlike native DNAs, can be used as primers and probes for diagnosing cancer." "Native DNA exists in the body as one of forty-six large, contiguous DNA molecules…. Isolated DNA, in contrast, is a free-standing portion of a native DNA molecule, frequently a single gene…. Accordingly, BRCA1 and BRCA2 in their isolated state are not the same molecules as DNA as it exists in the body." "we conclude that the challenged claims are drawn to patentable subject matter because the claims cover molecules that are markedly different—have a distinctive chemical identity and nature—from molecules that exist in nature." Among other problems, Judges Lourie and Moore don't understand a basic fact of genetics: that genes are "isolated" by our body's own genetic machinery when they are copied into RNA and then translated into proteins. Or perhaps they do understand, but they don't care because they just want an excuse to keep gene patents around. This is what can happen when lawyers (judges) make scientific decisions: they go on for pages and pages about the semantics of a word ("isolated"), and produce a result that is scientifically meaningless. "the question in this case is whether an individual can obtain patent rights to a human gene. From a common-sense point of view, most observers would answer, `Of course not. Patents are for inventions. A human gene is not an invention.' The essence of Myriad’s argument in this case is to say that it has not patented a human gene, but something quite different—an isolated human gene." So that's two judges (Sweet and Bryson) against human gene patents, and two in favor. This case isn't over yet; last week's ruling by the 3-judge panel will likely be appealed to the full appeals court next. It's hard to predict what they will say. 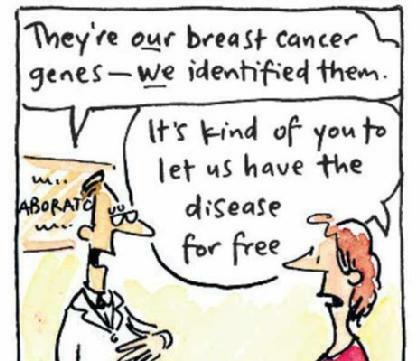 Meanwhile, Myriad charges $4000 to run tests on BRCA1 and BRCA2, as I wrote last year. This means that if a woman wants to test her own DNA for any mutations in the BRCA genes - including mutations that weren't even known when Myriad got the patent - she must pay Myriad merely to look at her own genes. I'm not a lawyer, but I already see one way around Myriad's patents in this flawed decision. The judge's (and Myriad's) reliance on "isolated BRCA genes" refers to the process of isolating and copying the genes using a laboratory method called RT-PCR, and then sequencing just the isolated bits. Today, though, we can sequence a person's entire genome, without "isolating" any particular genes, for under $5000, and then we can test for mutations in the BRCA genes without ever "isolating" them. In fact, a colleague and I published a paper just last year describing how to do this, and we released a free software package that allows anyone to test their BRCA genes at home on a desktop computer. Genomics Law Report has a detailed legal analysis of what our software means for the Myriad case. Scientifically, it shouldn't matter how the judges define "isolated" DNA. And as two federal judges have now ruled, genes are not inventions, full stop. What's more, gene patents slow down science by throwing legal barriers in the path of anyone who wants to work on those genes. Finally, I'm amazed at the hubris of companies like Myriad - or anyone else - who claim they "own" a gene. Let's hope the full appeals court will reverse the tortured reasoning of Judges Lourie and Moore, and get the patent lawyers out of the laboratory. Well surely by their logic you could build a test based only on a relevant short section of the gene (which I assume most tests actually are anyway) and if they challenged you, say: you patented the gene, we're just using an isolated section? I might have to quote you without attribution on this issue. It's OK, it's not plagiarism because I'll only be using isolated paragraphs. "Judges Lourie and Moore don't understand a basic fact of genetics"
They don't understand the basics of evolution either. Individual humans will inevitably show variations of the BRCA genes. How different does a gene have to be to covered by the patent? (I assume Myriad's patent covers all of these variants.) Do related species have variants of the same gene that fall within the variants spectrum that the patent covers? If so, does this than mean that they own those genes as well? How far back in evolutionary history can you go and still 'own' a gene? Where does this lunacy end? Isn't this analogous to mining? You can patent the Hall-Heroult process for extracting aluminum from bauxite, for example, but not the aluminum itself, which is a product of nature.